Foodies know that some cities and foods are just inherently linked. And we’re not talking about the all-natural treasure troves of produce, like Ontario peaches and home-grown Alberta beef. We’re talking about the stuff that gets you to bolt from your apartment when intense hunger hits, even if it means standing in a long lineup filled with equally hangry customers – like shawarma in Ottawa, poutine in Northern Ontario or mile-high smoked meat sandwiches in Montreal. But when intense hunger hits for a genuine donair and you don’t quite have the cash for a plane ticket to Nova Scotia, what’s a foodie to do? You could always contact new budget (super-budget) airline DonAir. Okay, so they’re a little no-frills. No carry-on, no wine, no in-flight entertainment. In fact, you might say they don’t even have “planes,” per se. But the fact is, for $7, you get a donair. 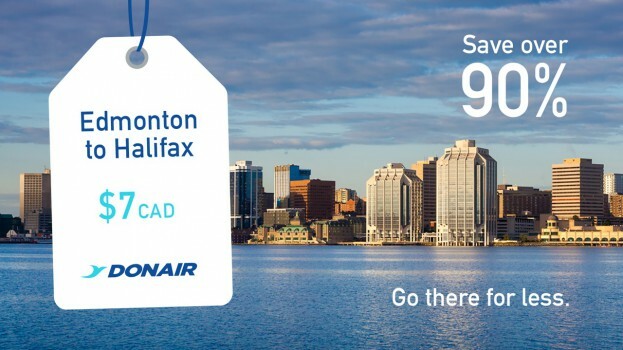 DonAir is indeed a fictitious airline, one created by small Halifax creative shop Wunder. The client was Halifax-based Donair chain King of Donair, which recently made its entry into the Alberta market. You can check out the videos for DonAir here. Beyond the video spots, Wunder even created a fake booking website for King of Donair. Seems legit. While we’re sad we can’t literally fly to Nova Scotia for $7, we’re pretty stoked to know that Albertans can bring Nova Scotia a little closer to them. Without the time change.